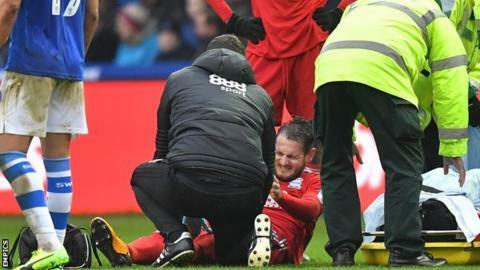 Birmingham City full-back Jonathan Grounds could miss the rest of the season after suffering a knee injury. Grounds, 29, damaged his medial ligament during Saturday's 3-1 win over Sheffield Wednesday at Hillsborough. The left-back has played 25 of Birmingham's 30 Championship games this season, but manager Steve Cotterill confirmed he is set for a long lay-off. "He's struggling, I am not sure he will play again this season as it's quite a bad medial ligament tear," he said. Birmingham, who face city rivals Aston Villa on Sunday, are 19th in the Championship, four points above the relegation zone after winning their past two league matches.